We made it to southwestern South Dakota and our first National Park! Badlands is 244,000 acres of bizarre that includes sharply eroded buttes, pinnacles and spires surrounded by a mixed-grass prairie ecosystem. The mixed grass prairie is a transitional zone between the tall-grass prairie to the east and the short-grass prairie to the west. It's hard to wrap our minds around early settlers navigating through this area with horse and buggy. A storm moving through the Tetons gave us an extra day to explore, and we'd considered backpacking for a night in Badlands. But after seeing them with our own eyes, and realizing the water situation, decided to explore for the day instead. Water is very scarce, and even if you do find it, the sediment is so thick it can't be filtered. 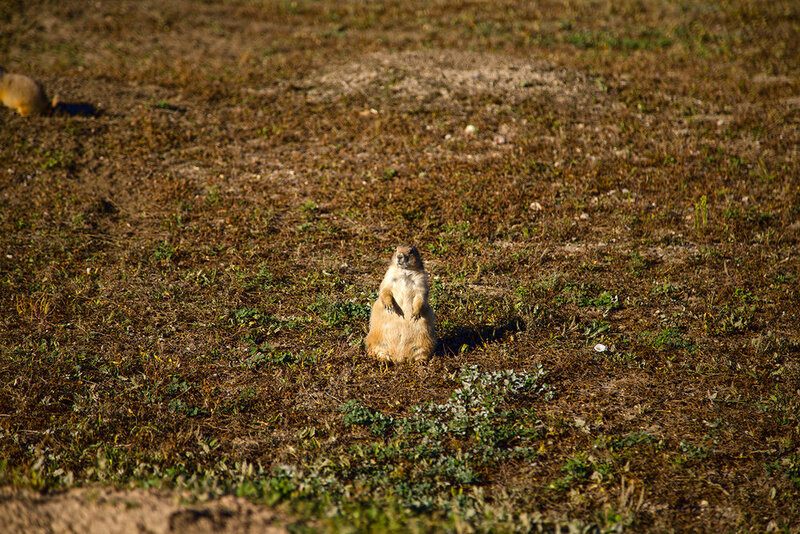 We came across hundreds of prairie dogs, all chattering and scattering as soon as they spotted us. Except this one guy, who my daughter named "Mr. Chubs", that came right up to us, got on his hind legs and sang us a sweet prairie song. Such a cutie. We hiked a short trail, but wasps surrounded us. Even driving through the park with the windows down we quickly collected a bunch of wasps and found ourselves pulling over and evacuating with our hands in the air, running for our lives while laughing hysterically. With our first Park under our belt, we're packed up and headed west. Another day and we'll be in the Tetons.